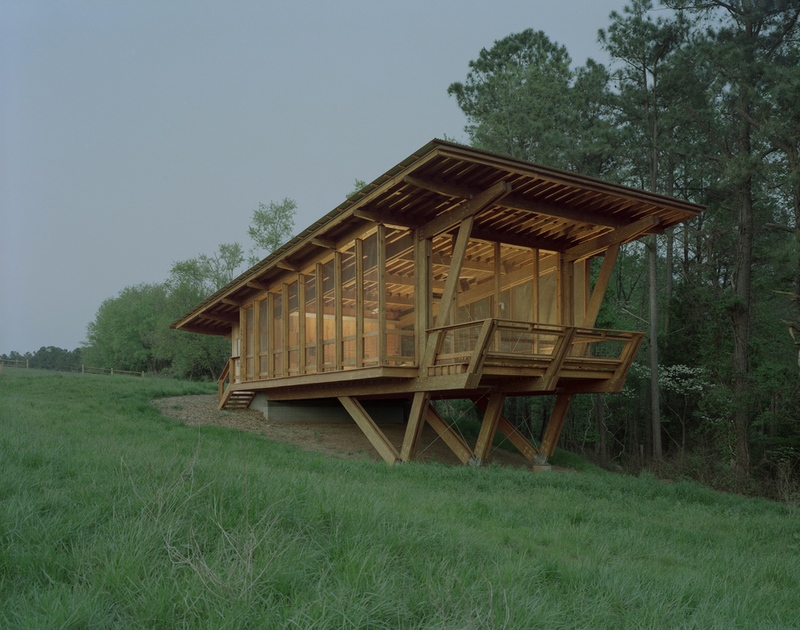 The North Carolina Museum of Natural Sciences’ Prairie Ridge Eco-station for Wildlife & Learning is the first part of a phased project, which began in 2003. The diverse, 38-acre site is a living classroom for school groups, educators, and learners of all ages to visit for a day trip or a unique overnight field trip. As an outreach program of the museum, the center fosters an appreciation for the state’s natural resources and natural diversity for all of its visitors, and represents sustainable architecture in its design and construction. Phase One is the Outdoor Classroom, which was to include a screened-in observation deck/classroom with prime views of the site, a director’s office, and restrooms. We realized that building needed to be a teaching tool: a structure that would not only respond to this landscape, but also embody lessons about sustainability. Siting, orientation, forms, materials, and construction methods were essential considerations. As a result, the 1400-square-foot Outdoor Classroom is built on a hillside, constructed with parallel strand lumber. Earth disturbance was kept to a minimum to avoid erosion. Concrete masonry units in the foundation are made of 100-percent recycled materials. Recycled, untreated, scrap lumber provides mulch for landscaping needs. The classroom’s deep, south-facing overhang maximizes sun exposure in winter and creates shade in summer. Along with the screened walls, this orientation catches year-round southwesterly breezes. Even during the hottest summer months, the classroom remains pleasant and comfortable through completely natural ventilation. The building also features zero-percent runoff with recycled storm water: A cistern collects rainwater from the classroom’s roof for flushing toilets and minimizing the impact on local fresh water sources. Photovoltaic panels provide electrical power and light. 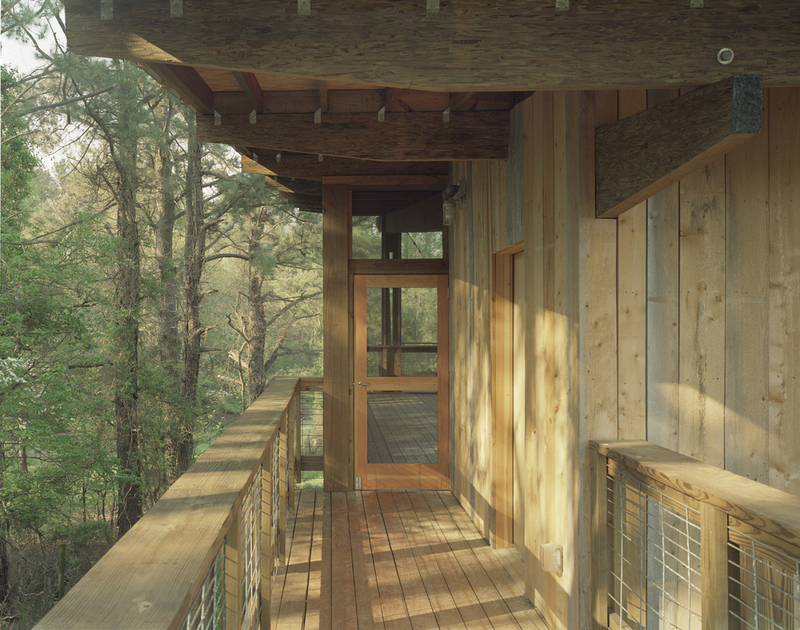 “Frank Harmon Architect designs a tree house-like observation perch for students of the natural world.” – Architectural Record, November 2006.